At first jar opening, I could smell the fragrance rising from the glistening, pure white sugar crystals. Lifting it for a closer sniff, I get a beautiful blend of all three scents. Such a wonderful aroma, I was ready to get a spoon and dig in! But instead I went to the sink to do a test run of the scrub with a hand washing. 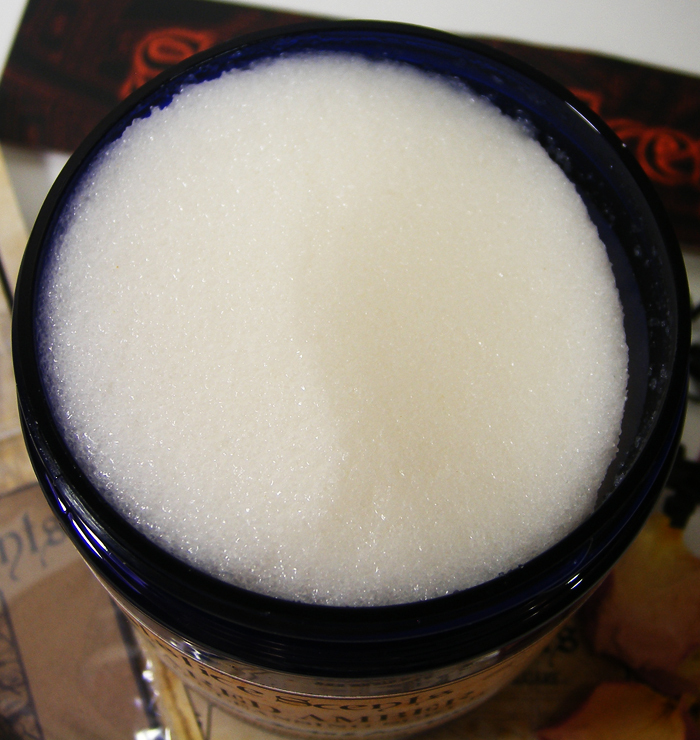 Its nice and scrubby, the sugar granules seem to be very similar in size and as I rubbed I saw some bubbles while the scrub became creamy almost like a lotion. Very nice! After I towel dried my hands I could still smell this tropical scent! Paradise! The mini vials in the second photo above are perfume oils. I ordered two, and got two free since it was my first purchase with SS. She even let me choose the scents for the free ones! 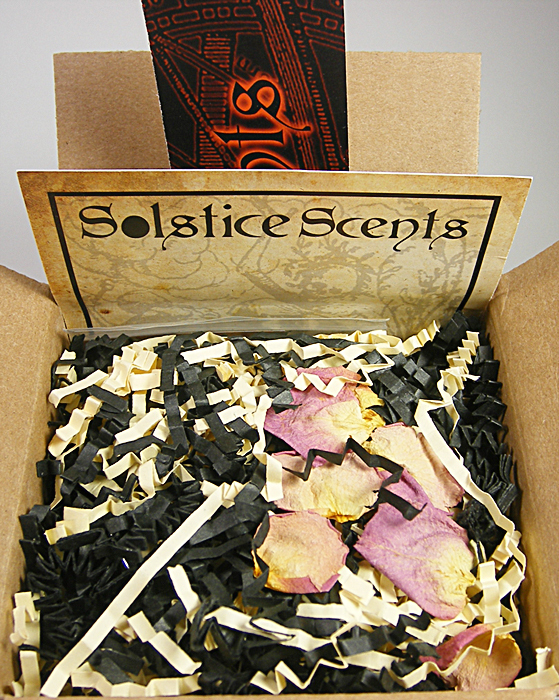 --I am fairly certain that I can smell each of the above scent notes, they're really well balanced in this blend. 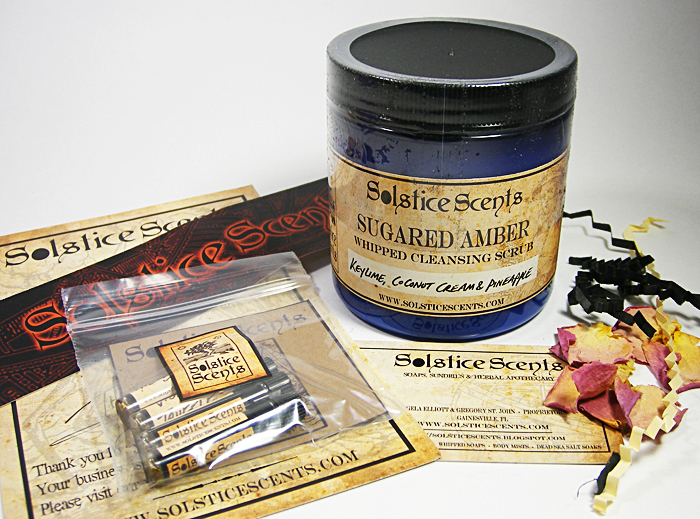 I really love amber, and its definitely coming through on my skin; the spice is very soft which is good because my chemistry tends to amp spices. I smell something sweet now which I think is the vanilla but the tobacco is keeping the vanilla grounded in a very nice way. The patch is nearly hidden in here as well as the oakmoss, very subtle for both. I am really digging this scent, I think it'll be perfect for cool weather; a nice and cozy scent! --Wow! So complex, its difficult to describe. The chocolate is a nice rich bittersweet dark chocolate, nothing fake here. I get a top note that's a little green but not overly so, very well blended in. The violet sits just under the chocolate, as it morphs the violet turns to a soft powdery scent. The longer its on my skin, the more it changes to sweet scent. The vanilla base lingers throughout, making this a very well blended scent. --Oh Cenobite, how do I love thee! Very boozy smelling in the bottle but once applied the fragrance blossoms into the most wonderful, deep, rich vanilla. The longer I wear it, the more it smells like vanilla extract, straight from the bean. This is the first vanilla that has not turned to plastic on me. Win! --This is the fragrance that drew me to SS. I love amber, and this sounded like a wonderful blend to try. Boy am I glad I did! Its a very lovely rich, yet sweet amber paired with orange and clove; which I think really enhance the amber in a wonderful way. I don't quite smell the ginger as a single note, but I am sure its there. Oh yes, now I smell the ginger layered on top of everything spicing it up just a hare. I wouldn't realize it was there, had it not been listed as a scent note. Gah I could totally live in this fragrance, its that good. If you're an amber lover, definitely give this a try!